Conservative robocalling firm Dialing Services LLC hasn't gotten the message about its illegal practices. It's usually illegal to make robocalls to cell phones, but one conservative robocalling firm apparently hasn't gotten the message. The Federal Communications Commission announced a $2.9 million fine Thursday against Dialing Services LLC, a New Mexico-based firm that the FCC says continued to place robocalls over the past year despite having been warned against doing so in March of 2013. 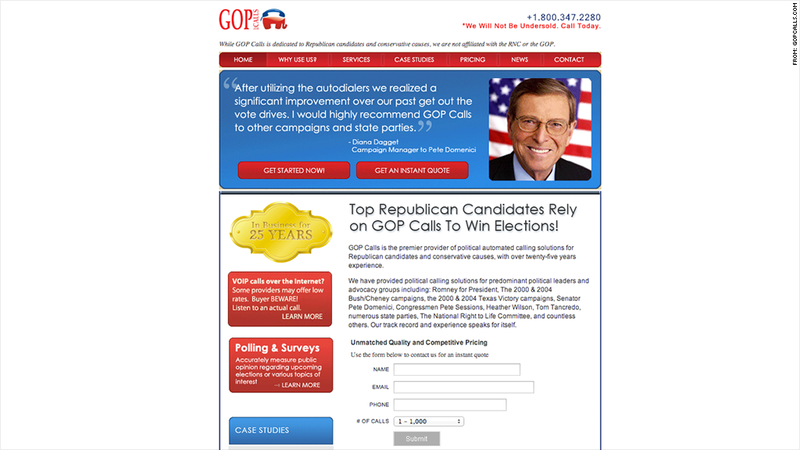 Dialing Services runs the website gopcalls.com, which says it's worked with Republican candidates and conservative causes "for over two decades." The site claims to have provided "calling solutions" for political candidates including Mitt Romney, Tom Tancredo and George W. Bush. The company received its warning from the FCC last year after allegedly placing more than 4.7 million robocalls to mobile phones during the 2012 election cycle. It's illegal to place robocalls to cell phones except in limited circumstances: when the calls are made for emergency purposes, or when they're made with the prior consent of the recipient. FCC enforcement chief Travis LeBlanc said the commission is "committed to protecting consumers from harassing, intrusive, and unwanted robocalls to cell phones, smart phones, and other mobile devices." Reached by phone Thursday, Dialing Services owner Chris Kolker said he hadn't heard about the fine and needed to consult with his attorney.